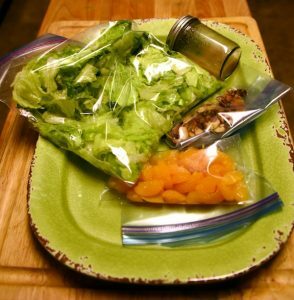 Three Bag Salad: a combination of lettuces, canned mandarin oranges, celery, and sugared almonds, mixed with a simple oil-vinegar based salad dressing, makes for a favorite vintage salad. Make a head of time, using plastic bags and store in the refrigerator for up to 24 hours. Salads held a primary place in a dinner menu of the kitchen circuit of the 60’s. Fresh vegetables, especially, tomatoes, peppers and cucumbers were more seasonal and often unavailable to the housewife, so they turned creative with recipes that used canned fruits, nuts (optional) and a limited selection of lettuces. This crowd pleaser is a year-round favorite at our house. Thanks to Eve Cagle for introducing this recipe to me. Easy recipe project for children. Cook almonds and sugar over low heat until sugar melts and almonds are coated, stirring constantly. Cool and break into pieces; place in plastic bag. Tear lettuces into bite-sized pieces. Place in plastic bag with celery and onions. 1 can, approximately 11 ounces, mandarin orange segments, drained. After draining, place in plastic bag. Place all ingredients in tightly covered jar, shake. Place in refrigerator, if preparing ahead of time. Does anyone else save glass jars for mixing salad dressing? 1 can drained Pineapple chunks can be substituted for orange segments. Or try fresh chunks of mango. I tried blueberries but my kitchen tasters weren’t impressed. Always handle salad greens with care. Wash well, drain and dry greens before storing, chill well before using. Perk up soggy lettuce by adding lemon juice to a bowl of cold water and soak for an hour in the refrigerator. 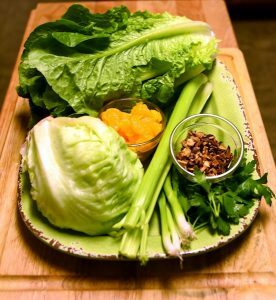 Lettuce and celery keep longer if you store them in paper bags instead of cellophane. To remove the core from a head of lettuce, hit the core once against the counter sharply. The core will loosen and pull out easily.